It’s April 27th and American Bottle Auction finished their 61st auction last night with a roar. We want to thank all the people that bid in the auction whether they won anything or not. I thought I would write some thoughts down on what we thought of the sale, anybody have another C.A. Slack for sale? First off, this auction seemed well organized, both a diligent effort by us and the amazingly organized collectors bidding in it. It’s apparent that the computer age has now become a reality as only one person bid by phone. Lots of people called in about the bottles and gave us plenty of time to send out additional pictures or videos to better describe the pieces we had for auction. We also had a good number of collectors come in and take a look. That helps even the eastern folks who can’t see them but know someone out here who can. All in all it was a very orderly and well managed sale on the customer’s side, spending time to know the software, checking the videos and really understanding the rules. We’ve noticed a more educated and alert audience in the bottle market. Ten years ago we’d need to explain various facts or details about a bottle and now it seems everyone knows it already. They often know much more than we do. Condition has become an issue of great importance to some, not all collectors. This auction brought in $280,000, not bad for 150 lots. We had over 200 bidders and although that may not be up there with Sotheby’s, any time you get more than a bidder per bottle you have something. There were some surprises and some disappointments but like I tell consignors who bring more than a half dozen pieces to the table, add it all up and you’ll probably get what you thought or more. The hobby is apparently very strong, on most of the bottles we had. 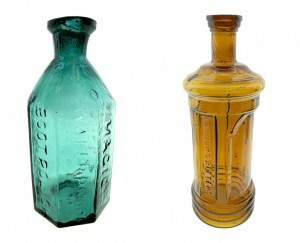 We didn’t have any historical flasks in this sale so we can’t elaborate on that but the bitters market seems especially strong, condition and color a major hurdle in getting the top dollar. We tried to do some things a little different in this sale and maybe they came back to bite us. The Sheldon’s Magic Boot Polish was a great looking bottle but had a resin repair on the lip which we showed using a black light, buyers may have appreciated the effort but they didn’t bid on the bottle. It brought a grand versus the $5,000 they usually garner. 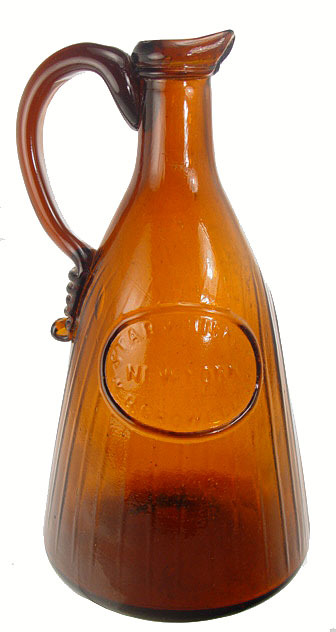 We did the same with a nice looking Lacour’s Bitters only to see it struggle to $700. We also realize that by showing a video and multiple pictures we open ourselves up for more scrutiny. If we show you two pictures and mention a flaw but don’t show it, collectors will either pass or ask for more details. We’d rather give you the details ahead of time so we don’t have to go back. Returned bottles are an auctioneer’s nightmare and we’ve hopefully staved that off by showing as much as we can. The consignor might not appreciate the effort but…it’s a gray area we need to better explore. Is showing too much causing problems or stopping a problem before it starts? The western sodas and mineral waters did well, the rare examples from Nevada were pretty solid, not what they’ve been in the past but the soda and mineral water category is like a roller coaster. It doesn’t take many collectors to turn it around either way. The Lyon’s Powder in the larger size was a bit of a surprise, we were told to expect it but at $3,200 with the added juice it’s still a bit of a eye opener. Puce umbrella inks are hot and we had a good one that brought $2,400 (all prices before the 10% buyers fee). Who says western flasks are fading? Our Castle flask brought $6,000 and the Fleckenstein & Mayer $1,000, not bad at all. 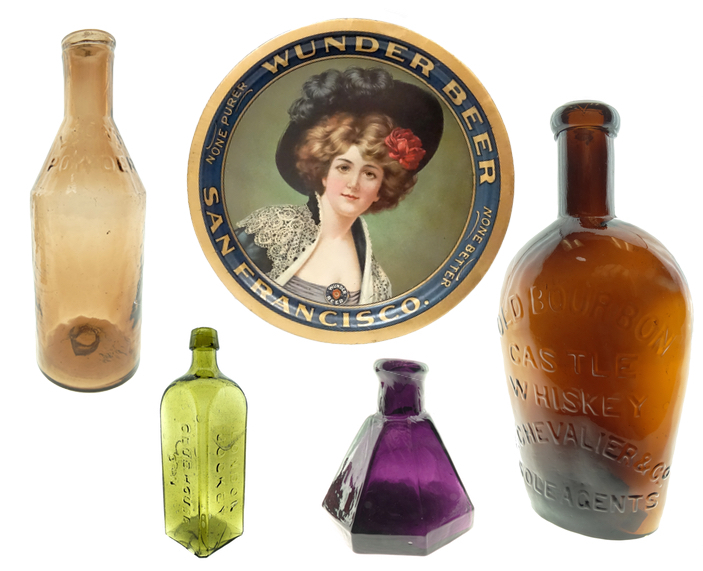 A Wunder Beer tray brought $2,800 but the small advertising pieces were a bit of a disappointment going under $300. Is advertising losing its luster? A beautiful London Jockey did $4,600 and the rarer cleaned variant $2,200. The cleaning had a pretty big impact but the pricier variant was an extremely rare color and in great condition. A few years ago we could have seen that going for double or more. And what’s time to a pig? Well, apparently a lot as the Berkshire and Duffy Crescent did $2,200 and $2,800 respectively. Western whiskeys as well as examples from the east did well and our top lot the Taylor’s Virginia N. brought $10,500, nice in these days of wondering where the western fifth market is headed. Good examples are selling strong, maybe not what they did in their heyday but that’s understandable. Overall we were very impressed by the strength of that market, an SHM Superior with sizable but harmless pot stone brought in $2,600, a bargain as that bottle was always at least $5K or more. 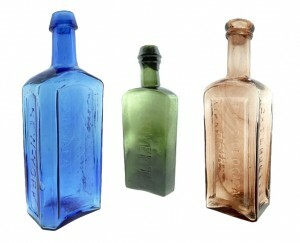 Can we ascertain that a damaged or problematic bottle brings half of what a perfect one will depending on the problem? The tooled top western fifths were decidedly strong, my goodness a C.A.Slack (who?) bringing $3,600. Most likely a collector needing to fill that last spot or two in the collection. A Buffalo Bourbon in about perfect shape brought $1,200 while a Chesley’s Jockey Club did $2,800. 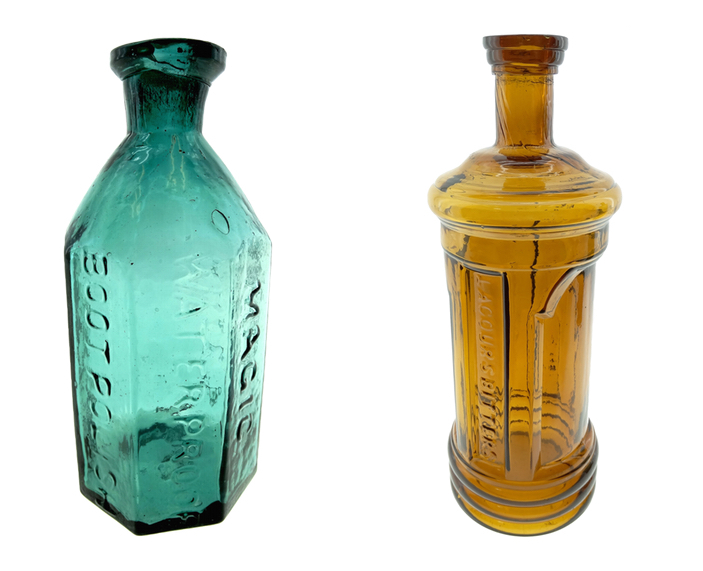 Pontiled medicines fared nicely, a large blue and beautiful Wynkoop’s Katharismic and ague and fever cure sold for $8,500 and $3,600 respectively. Other pontiled meds like the Covert’s Balm of Life ($2,200) and Hyatt’s Infallible ($2,200) showed us that prices may be down a bit but solid. A Dr. Tebbett’s Physiological Hair Regenerator in mysterious wispy champagne brought $3,600, a good buy as we’ve seen oddball examples sell for more but again, that was then. A beautiful Henley’s Beef & Iron brought a decent $800 and we doubt we’ll ever see a better example. Bitters did predictably well. If all you ever collected was bitters for the last 30 years you’d need a crowbar to get the smirk off your face. 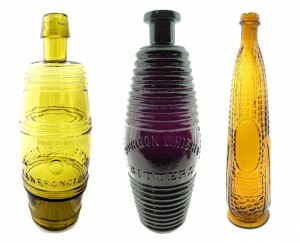 Eastern/western, it really doesn’t matter, bitters bottles come in such a stupendous variety of colors and shapes that by all accounts it’s hard to believe they will ever slow down. 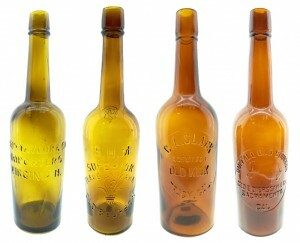 Some bitters have slowed mostly because of condition or the fact that there are more available. The Wormser Bros. is a good example. We sold a greenish yellow example a few years ago for $16,500 before the juice, that was pretty much a world’s record for a drop dead beautiful example. Now we have a very strong yellow with a touch of green, as nice as they come in that color and it faltered a bit at $4,200. The lesser of the two dragged in at $850. We’ve sold a number of those bottles and it’s not a secret. The puce Greeley’s, either variant, seem to be “around,” and that means a dip in price. We’ve seen this in not only our auction but other auctions as well. At $600 for a deep purple and $1,300 for a lighter purple variant you can look at that as a bargain or just another casualty of un-rarity. They are gorgeous bottles for a good price, nothing wrong with that. We are basically seeing common items selling for less, check the National Bitters in perfect condition in a light medium amber $650. But that’s just a couple examples of a bottle becoming more prevalent than times past, let’s look at some more success stories. 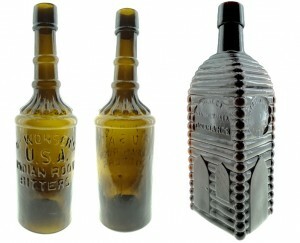 When we put out a scarce or rarer and more desirable bottle such as the Kimball’s or Phoenix Bitters we see more interest $1,000 and $1,200 respectively and of course both of those are pontiled. There seems to be a 30% price on the pontil, it’s a big deal. No pontil and they do $800. We were impressed by the astute buyers who looked past the damage and bought the Rosenbaum and Lyon’s Bitters. At $2,200 and $1,300 a collector from the east might stare in wonder but what they don’t know is these bottles are as rare and important as any eastern bitters with livable damage (damage that is hard to see on your shelf). Western collectors know their chance at owning either bottle in their respective colors is almost impossible or very expensive and they take solace in having a genuine example albeit damaged. Bully. If a damaged bottle is good enough for the Corning Museum why not me? The barrels have been showing in swarms lately and although there are a lot of them out there, particular colors in particular variants are showing good returns. A Greeley’s R/H R101 in a very fresh and rare colored green with just a smidgen of a dink on the lip did $2,200. Without the dink? Probably a lot more, even though you can barely see it. Cabins are always hot and although a drop dead example in canary yellow 4-log Drake’s did $2,600 we thought it was underpriced. An amber/olive 6-log Drake’s brought the same. A lot of examples out there and color and condition are going to be the prevailing factors down the road. 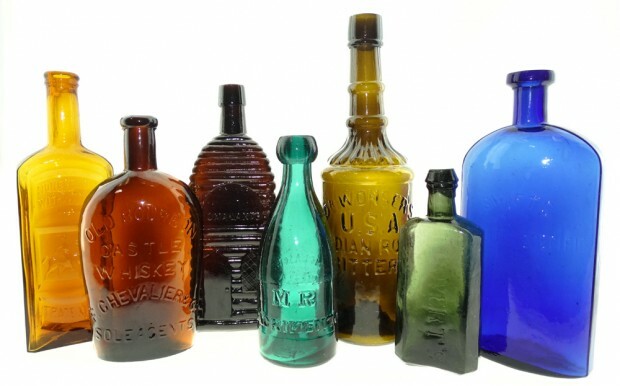 Color is by anyone’s guess the most important aspect of bottles and especially bitters bottles next to condition. True, a bottle might be common in amber but finding a one in a hundred green one is the stuff of legends and it shows in the price. A Johnson’s Calisaya in an amber with green in beautiful condition with a nasty crude top brought $5,000 compared to the $200 you might get in an amber example. Color is king. A western green/yellow Alex Von Humboldt’s fetched $8,000, one of the top bottles in the sale. It had a tiny ouch but was almost undetectable. 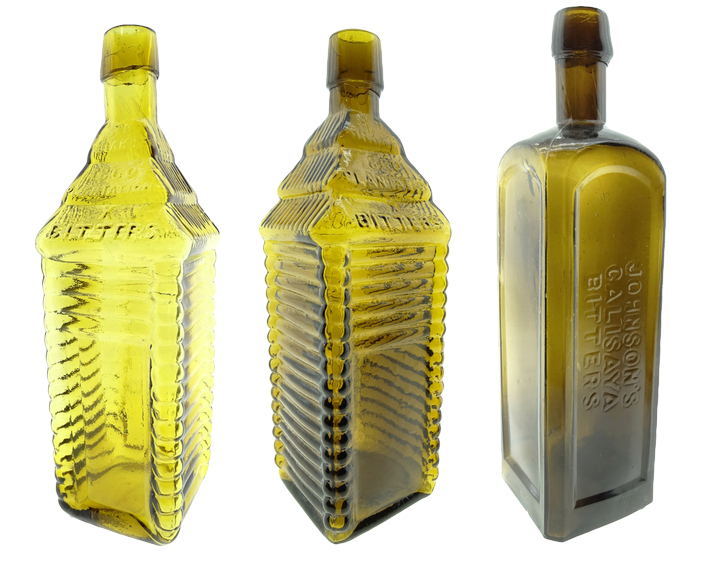 Another beautiful bottle, the Homestead Bitters in a dazzling yellow with a touch of green came in at $8,000 to no one’s surprise Color added $7,500 to the price and when discussing color variations in bitters bottles the Homestead is a name that is brought up often. No surprise the two top money bottles were bitters, each representing the west and east. 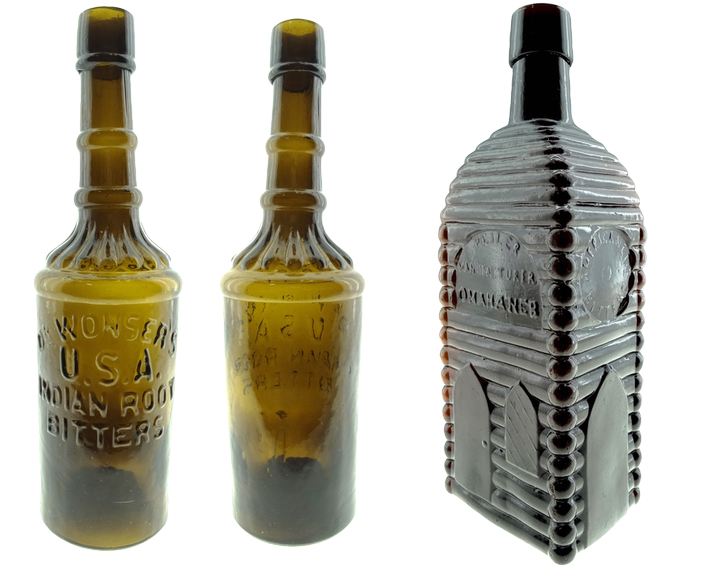 The Wonser’s Indian Root Bitters in sensational old amber with just a very minor pot stone brought in $13,500 as did the American Life Omaha variant with a minor flaw. The Wonser’s was as nice as almost any we’ve seen and collectors looked the other way when it came to the pot stone. You can’t keep a good bottle down and for overall aesthetics the Wonser’s are a nice as any western bitters around. This one had it all and it showed. The cream rises and in the American Life we found a bit of expected disappointment. Rare as hen’s teeth not more than a year or two ago, there have been three at least of the Omaha variants moving into or on the auction block. That along with a tempered perspective on the overall market gave way to a solidly low price for a terrific bottle. We have to believe the buyers of the last two American Life’s will be smiling when another doesn’t come up for a decade. It’s smart to buy when a rare bottle is suddenly available. The days of the $40k American Life might be gone but we doubt they are going down alone. Are we seeing a pause in the almost ritualistic dispersing of funds on bottles with a ton of appeal and a price tag to match? Bottle collectors love their bitters and there’s no sign of letting down. We would be remiss in not mentioning the mostly Sandwich Glass Works items we were able to include from the collection of Bryan Grapentine. 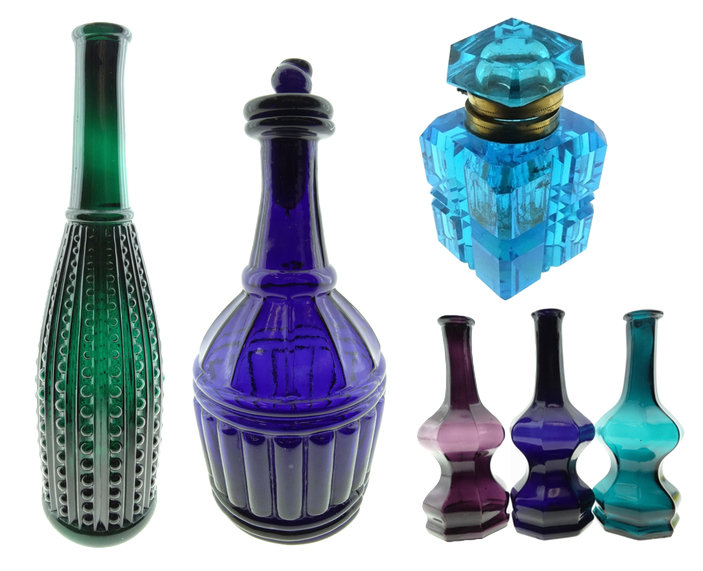 They included everything from an 1876 Centennial inkwell to fancy cut inkwells and some very rare and beautiful colognes and decanters Overall they did well with a rare purple Monument cologne selling for $3,000. The Monuments all did well with the four selling for a little over $5,500. A dark green beaded cologne brought $1,500 while a set of three corset waisted colognes brought $1,200. All in all the Sandwich items we sold fared pretty well, we’ll have to see how it compares nationally. From all accounts the bottle market is still filled with good natured laughter and effervescent moods, depending on condition. At what point it goes from rollicking fun to serious business we may never be able to tell. We can’t have an auction without the collector base that’s out there today. Veteran collectors as well as the eager and ready to learn new faces are in full force throughout the country. 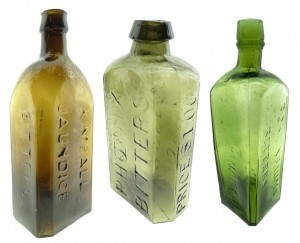 We see so many new and younger people getting interested in the bottle collecting hobby, is it a sign of things to come? Sons and daughters of collectors, friends of collectors and people who see what we all see in the glass and in the people that collect it. There are so many websites and books new and old that collectors can spend their days and nights checking it out. The hobby is a “big deal,” now and with more core collectors than ever before. As digging becomes a lost art, we now have all the chips on the table. There is no buying new chips from the bank, what we have now is going to have to last forever. Sure there’ll be new bottles dug and boxes and collections uncovered but I think we can safely say that the rarity of certain bottles will stay pretty constant from here on out. That is probably a good thing, in the art world and other places of “collecting things ,” inventory is pretty finite. We know how many Van Gough’s and Renoir’s there are. We know which stamps were made and where and how many Flintstone lunch boxes there probably are. With bottles now it seems like we are closing in on the variants, rarity and established collections around the country. It brings a little pause to the hobby, but there will always be a new find or bottle for sale. Great writeup and an even greater auction. The 10% buyers commission was a welcome surprise and will definitely keep you tops on the radar when I look for bottles to buy from an auction!!! Keep up the good work and thanks much. You obviously love anything that has aesthetic quality and it shows in your appreciation of bottles. We appreciate the nice words and hope you know we are always here if you need anything. Jeff,congratulations on a great auction and write up. you captured thoughts shared by many even if not mentioned before. thanks for your help and contributions to the FOHBC. we are able to promote the shows and hobby because of your generosity. Nice sale and good write-up Jeff. As to all the chips being on the table, some categories are more mature than others. While we pretty much know what’s out there in FLASKS, new finds in BITTERS keep occurring. That’s one of the things that keeps me interested in Bitters…a category that’s far from being “old school” ! That’s so true. 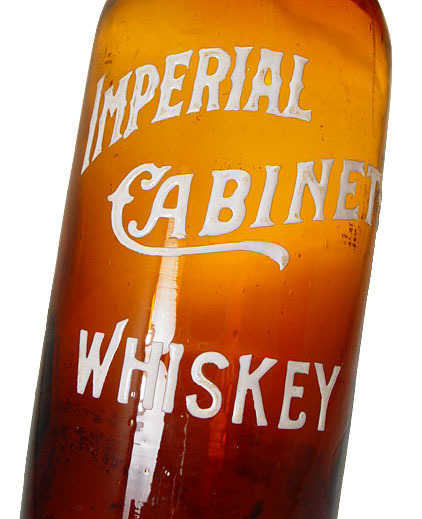 I know a recent collection we bought had a half-dozen super rare bottles, all with the “bitters,” name on them. And we can’t forget about known bitters in new colors. The supply seems endless. I think we’re all excited at the prospect of emerging finds in both the bitters category and all the other categories destined for collectors shelves. I enjoyed this auction as well as all the past auctions and look forward with great anticipation to each one. Even though I didn’t bid in this one, it’s exciting to follow the prices as the auction progresses. Just seeing some of these rare pieces is pure pleasure. You guys couldn’t do a better job than you have done in total coverage of every aspect of each bottle (or other collectible). you leave absolutely no doubt as to the condition and color of the item and if the bidders miss something they aren’t paying attention. You do so much for the hobby that you are an essential resource for any collector to stay in touch with. Keep up the great work and hats off to some of the best in the glass world. Thanks much Al, we’ll see you next time! We really like what we do and know how important the customers are. We thought that 10% was manageable and might get a few more bids helping the consignors out. Really enjoyed you auction write-up. I feel it is better to show and tell all the problems with a bottle. That way a person can make up their mind if the would like to purchase it for their collection or not. 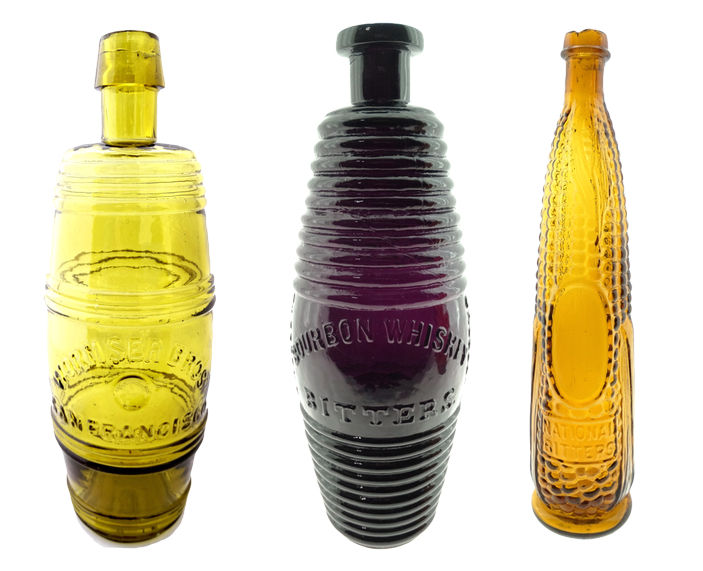 We have collected bottles over 50 years and seen a lot of up and downs on bottles. Bottle collecting (as far as people purchasing) is like a pyramid. People who can afford to purchase bottles for thousands of dollars are at the top of the pyramid and then the level of power of purchases decends. After the people at the top add that special bottle to their collection they don’t need another of the same…causing the price to go down. So purchase that bottle for the beauty, the history and all the great people you meet in this wonderful collecting hobby. Don’t just make it for and investment and you will enjoy it even more!! I couldn’t agree more. I know the consensus among a lot of collectors today is buying mint bottles. That’s important when you are actually investing in a bottle, and if you don’t think spending $20 large on a bottle is an investment I’ve got some ocean front proPerty in Arizona for you. Hey, we all have our limitations on what we can buy and a lot of people want to buy the best and that means perfect. 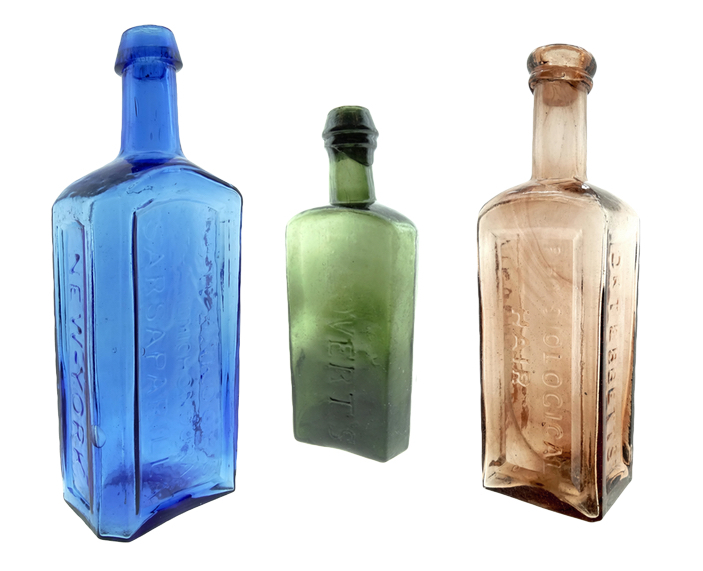 I for one can live with a small ding,or pot stone but the price of some bottles now makes it a big deal if you’re dropping a lot of money on your favorite new bottle. You two have been collecting so long you must have seen it all. You are the backbone of the hobby and your input is highly regarded. This is a good sign for the hobby. Being one of the younger gen. of digger/collectors for so long, and watching the first gen. pass on more often. I was starting to worry where was the next gen. of collectors. Well, Hello internet. This has broaden our hobby in a big way. As show Chairman and long time member of the 49er HBA. I have seen our club shrink, but our show and bottle auctions have grown in a big way. Why? 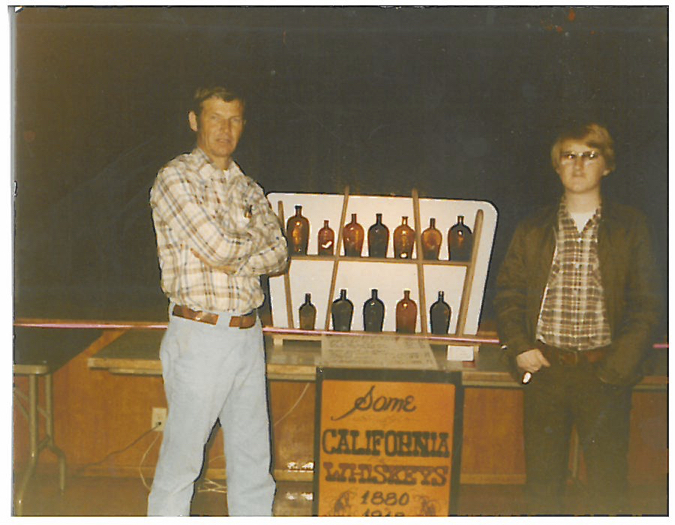 The internet has created the largest club of collectors who stay connected at any given time and bottle shows are still the best place to get hands on experience. Bottle prices have settled, but the mid level bottles are holding strong. Rare bottles will always do good. The days when bottles were bringing $20, $30, $40,000 regularly are over. There is a better playing field now for new collectors. Lets hope this trend continues. Jeff, I think it is quite an accomplishment to stand out from all of the other auctions. Your marketing, lot variety, lot quality, photography, bottle descriptions, and auction format are second to none. Keep up the great work. Super follow-up assessment. Nice auction Jeff. I am the happy winner of one of the bottles you mention in your review. I can’t “play” with the big boys, so it’s nice to be able to get a sweet bottle for less than 1K now and then. Keep up the great work. p.s. I do miss having your fine catalog to look at and reference over and over. trying to print it with my computer/printer would be a disaster. We had a number of catalogs printed up and they were available on demand. I personally like publishing a catalog but the cost has become pretty crazy. To print and send out catalogs to our regular audience runs around $14,000. If we did that we’d probably have to raise buyers and consignors fees and most people are comfortable either printing their own or just using their hand held devices to follow the auction. We are always happy to send out a printed catalog on request but the days of us sending out a few thousand are pretty much gone. On another note we keep all our auctions available online for you, so you can always look up a particular auction or just type in the name of a bottle and see what we’ve sold. Great Auction! Nice that it didn’t drag on for 2 weeks. The 10% buyers premium was great. Especially whether the purchase was cash or credit card. Looking forward to your next auction. 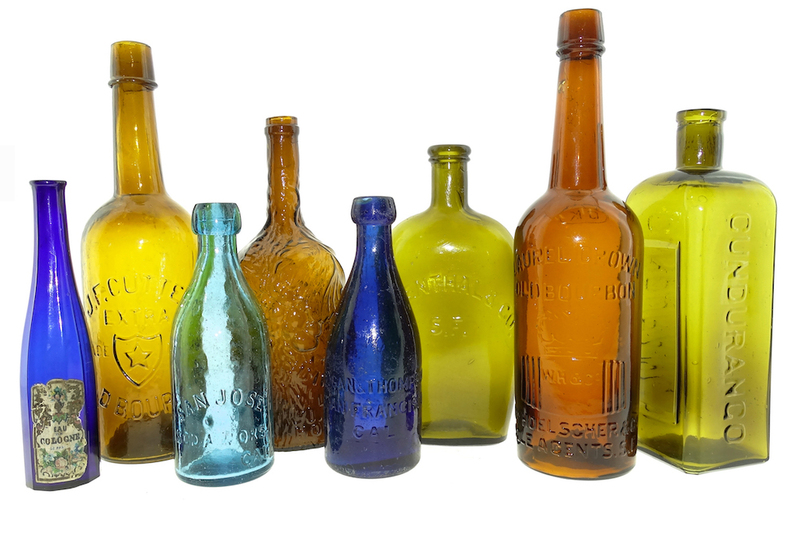 Full disclosure when describing the condition and nuances of bottles offer for sale is essential in establishing buyer confidence that they will be treated fairly. So, in my opinion the more information the better, keep it up.